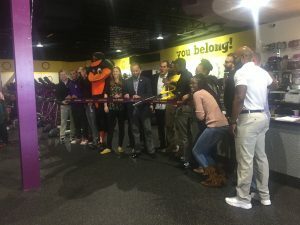 Earlier in the month I was invited to a grand opening for Planet Fitness held at The Alameda shopping center in Baltimore. As I embarked on this new assignment I was excited to learn the fitness center had partnered with the Boy and Girls Club of America along with Stomp Out Bullying an anti-bullying to help youth deal with bullying. As a young child I was often bullied and that’s why Planet Fitness’s mission is so important to me. Having to move as a young child every three years because my dad was in the Army, being the new kid in class was not in my favor, because I did not fit in. I spoke with an accent, which equated me as different. I was just a recipe for being bullied. Planet Fitness staff gets ready to cut the ribbon to open the new fitness center in Baltimore. In today’s society with social media and growing technology bullying has become hard to escape. Social media and phone apps are creating an growing epidemic of bullying for kids and teens. Bullying amongst kids and teens has become a huge problem in today’s society. The affect it has on someone can lead to drop in grades, depression, anxiety, eating, and sleeping problems. Bullying can also affect a kid’s mental state where often they may isolate themselves from everyone and feel a sense of loneliness. And unlike in the past, bullies are able to sit behind their phones to go after their victims anytime and anyplace. So when I was contacted by PR Rep. Emma Abbott to attend the Planet Fitness for their grand opening in Alameda where they have partnership with The Boys and Girls Club of America and the Stomp Out Bullying campaign I felt a sense of connection. Planet Fitness motto Judgment Free Zone has become more than a phrase for the gym, it has become a huge part in the anti-bully campaign. The Judgment Free Generation campaign began at a local level but has since become a national level. The goal of this motto is to create an environment where kids and teens are able to be themselves where they are not judged. During the grand opening I was honored to speak with two key players from Planet Fitness and The Boys and Girls Club of America. CFO of Planet Fitness Cyndi Crowl who was able to elaborate on the goal Planet Fitness hopes to accomplish with the Boys and Girls Club of America. “Increasing kindness, decreasing bullying, and creating a safe haven for kids,” Cyndi said is the goal Planet Fitness hopes to accomplish with The Boys and Girls Club of America and Stomp Out Bullying. The Boys and Girls Club of America often caters to afterschool programs so during the grand opening of Planet Fitness I was able to speak to Vice President Corporate/Business Partnership Matthew P. Death in regards to how do they handle bullying and why partner with Planet Fitness? 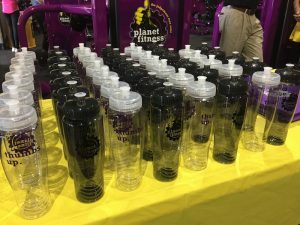 “The reason for partnering with Planet Fitness is because they stand by the very same values and expect their members to do the same which makes for a perfect match,” he said. How does your organization deal with bullying when faced? This new Planet Fitness accommodates 39 treadmills, 12 arc trainers, 11 elliptical machines, 10 bikes, and four steppers machines all under one roof of 16,000-square feet. As I toured the facility, I was impressed that Planet Fitness, Boys and Girls Club of America, and Stomp Out Bullying have come together to form a great partnership for the community. And you might be asking how Planet Fitness help kids overcome bullying when they are not simply old enough to become members of their gym? With that being said, Planet Fitness has launched a series of Mini Judgment Free Zones that are welcoming gym spaces in local area Boys and Girls Clubs. Planet Fitness has raised more than $1 million throughout the US and Canada to support the Judgement Free Generation in the Boys and Girls Club of America and Stomp Out Bullying. Check out Planet Fitness and you will be proud that you joined the anti-bullying fight.